GOODWOOD, England -- Rolls-Royce will display a concept car smaller than its Phantom sedan at the Geneva auto show in March. The concept will preview a "baby" Rolls-Royce sedan due to go on sale in the first quarter of 2010. CEO Tom Purves said the car's launch has not been delayed despite the financial downturn. "We're on plan with RR4. We haven't pulled the plug on anything," Purves said in an interview at Rolls-Royce's headquarters here. 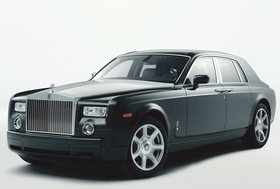 Rolls-Royce uses the code-name RR4 for the "baby" sedan. The production RR4 will be targeted at younger buyers and will be "more like a well cut sports jacket than a tuxedo [the Phantom]," Purves said. The RR4 will be powered by a new 12-cylinder engine not seen before on any BMW-group product, Purves said. BMW owns Rolls-Royce. About 80 percent of the car's its parts will be unique. Although systems such as air conditioning are shared with BMW, the switchgear visible to the Rolls-Royce owner will be completely different. Most production RR4s will be sold at a slightly lower price than Phantom, custom versions could overlap the larger Phantom in price. The Phantom sedan begins at £270,000 (about 236,000 euros) in the UK. The production RR4 could sell at about £200,000. The model's name has not been finalized, a Rolls-Royce spokesman said. Some sources have speculated that the company will revive its historic Silver Ghost nameplate for the model, which will be built alongside the Phantom at the factory here in southern England. The Geneva show car will be almost identical to the production car, Rolls-Royce insiders told Automotive News Europe. The concept for the RR4 most likely will be called the EX200. Rolls-Royce uses the EX designation to denote experimental concept models. Previous EX concepts have accurately previewed upcoming production models such as the 2007 Phantom Drophead Coupe and 2008 Phantom Coupe. The production version of the EX200 will be shown at the IAA in Frankfurt in September.